The two animals closest to a knitter's heart, I have to believe, are the cat and the sheep. There are great references in literature to the lion and the lamb and then there is, of course, the Tyger. Cats are the witches' familiars - the form that witches take when they want to disappear. Some also believe that cats are the spirits that give the witch her greatest inspiration. In Britain, cats, especially black cats, are good luck. Ironically the white ones are not. 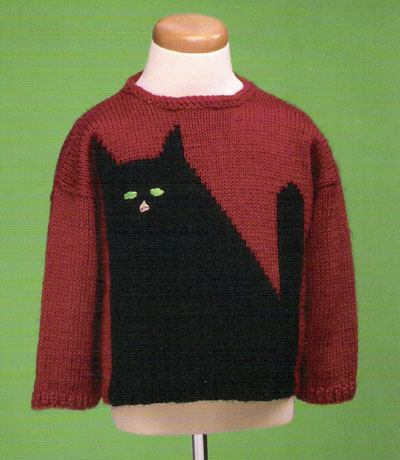 What is the synergy, though, between knitter and cat? 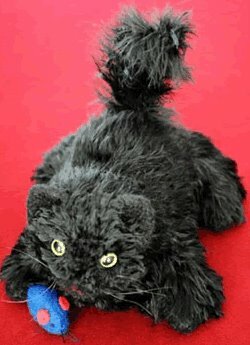 The newest addition to my cat family - we have 3 and they are all black, quite by accident - plays with my yarn. He is my company in the very early morning when I have time to knit without distractions - well at least except for having to play tug-of-war with Hunter to keep my tension from tightening. Perhaps knitters like cats because they are quiet company; they seem to be more sedentary than dogs. They appear to be at any one time thinking, meditating, even planning, perhaps their next attack on those obnoxious African Violets, all under the guise of being half asleep. A serene exterior housing a complex interior, the image of the knitter. What are we thinking, meditating even planning while slipping the stitches from needle to needle? Do these thoughts become part of our knitted designs? Do we knit waves of lace, longing for the sea or leaves and ferns for a walk in the forest. Are we through the twists and turns of cables trying to free ourselves or contain ourselves? I think that really wonderful designs connect with our inner voices, our inner thoughts and allow us through the knitting of them to say what it is difficult to express in any other way. More on this later. Let me leave you with an excerpt from an 8th century poem about a cat called Pangur Ban who liked to chase mice and a monk who spent a lot of time writing (read sedentary activity similar to knitting). We are reaching back over a millenium - awesome, indeed, " the more things change the more they remain the same"
The picture at top is Kitty, Kitty a knitted felted cat from Fiber Trends, for those allergic to cats, or just for the fun of knitting a cat. The sweater is from Vermont Fiber Designs. It is sized for children; but you could easily put the graph on an adult sweater pattern.